We have analysed the results of a recent survey that we undertook of solo entrepreneurs running start-ups that we had placed in flexible offices and workspace. We wanted to learn about their start-up journeys both before and after we had helped them find a new home for their businesses. The majority of respondents confirmed that starting and running a business was tougher than expected. Particularly as they travelled past the, what the Cameron Herold conceptualized Transition Curve, highlights as the ‘Uninformed Optimism’ stage. His model maps out the emotional rollercoaster that an entrepreneur will ride during the start-up process. The five stages of his model are, in order; 1. ‘Uninformed Optimism’, followed by; 2. ‘Informed Pessimism’ then; 3. ‘Crisis of Meaning’ — this is a critical juncture because, as Herold explains, the two options beyond this stage are either; 4. ‘Crash and Burn’ or to continue to run the business with; 5. ‘Informed Optimism’. Many respondents informed us that the process of starting up a business can be a lonely one. The harmful effects of loneliness are becoming more and more recognised — Vice recently reported that loneliness is more harmful to one’s health than smoking 15 cigarettes per day. The UK has actually created the role and appointed a ‘Minister of Loneliness’ — a project incepted by the late Member of Parliament, Jo Cox to help tackle the issue and its effects. Loneliness and isolation from community bear a strong correlation to occurrences of depression. In fact, it has become increasingly reported and recognised that entrepreneurs can be at greater risk of certain mental health issues. In the early 2010s, clinical professor at UCSF, Dr. Michael Freeman surveyed 242 entrepreneurs about their mental health. Of that sample, 49% self-reported having some form of mental health condition. Given its apparent prevalence, we were interested to learn how entrepreneurs dealt with their well-being and, in particular, loneliness, and how their methods helped them to maintain good mental health and avoid entering the ‘Crash and Burn’ stage on the Transition Curve. Many of the respondents stated that, whilst it is pleasant to be able to work from the kitchen table and avoid the rush-hour commute, working in a group or office environment was often missed. Being an entrepreneur will often necessitate extracting yourself from the conventional workforce and going it alone. This separation from a meaningful and significant community can be liberating (or even exhilarating), but it can lead to isolation and loneliness. 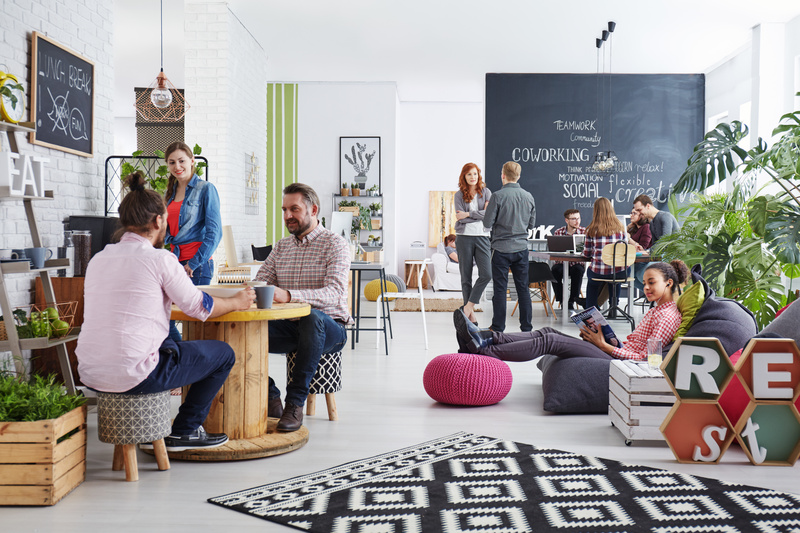 To overcome, this sense of social isolation, many respondents choose to work in co-working spaces at varying levels of frequency, with some using them the majority of the time. They are usually run on a membership basis, similar to a gym, where members can walk in, pick a free desk, plug-in and start work. There are other membership options that provide dedicated desks and private offices too and most spaces have meeting and conference rooms that can be hired on an ad-hoc basis. Some co-working spaces are dedicated to particular niches or industries so you can surround yourself with people working in the same field, however, many are non-specialized and accommodate users from all sectors and industries. Apart from the practical advantages such as access to expensive business equipment, most respondents advised that the main advantages to using co-working space was the social environment, the networking opportunities, the social events that are put on, the opportunities for collaboration, and the entrepreneurial spirit and atmosphere in general. Users felt a sense of relief that whilst they may be going it alone, many others were, “in the same boat as them” which helped. Given the increasing popularity of co-working spaces, it is logical that these growing communities of like-minded individuals are not ships passing in the night; collectively they represent a dynamic ecosystem that can actually reap genuine benefits to businesses, particularly nascent ones. Some respondents advised that they had met new business partners, colleagues and freelancers in co-working space too which had further bolstered their businesses. Co-working space membership does, however, cost money which is not always available during the early years — some respondents advised that when they were first starting up, they used cheaper options such as libraries — which, some might say, were the original co-working spaces — coffee shops and other establishments that provided both human interaction and a decent Wi-Fi signal. Another interesting trend we observed is the growing importance of virtual communities. We were surprised by how many respondents had actively created virtual social networks as well as physical social networks. Whilst the smart phone can be sometimes described as distracting and the cause of mindless behaviours such as obsessively checking social media feeds, it can also be used to create a highly useful and productive virtual network for an entrepreneur. Entrepreneur, author and motivational speaker, Jim Rohn famously said, “you’re the average of the five people you spend the most time with.” From several responses, it would appear that many entrepreneurs will ‘make do’ with spending time studying and absorbing the ideas of positive role models such as; Gary Vaynerchuk, Tony Robbins and Ray Dalio via audiobooks, podcasts, books, social media feeds, TED talks, and online publications, when they can’t actually spend time with and get two-way facetime with mentors. It was apparent that many respondents were tailoring their media feeds so as to feel inspired, motivated and not alone, and were actively removing negative feeds and influences. Respondents also found ways of optimising their learning processes by using their feeds to educate themselves, particularly when they didn’t have the time or money to study business courses. Some respondents advised that taking screen-shots of the timer at this point is useful also so that you can replay later when you get a chance to make notes. Also, playing audiobooks and podcasts at x1.25 or faster, where appropriate, can really speed up consumption rate. Some of the respondents surprised us by who they include in their virtual social networks — many had included podcasts and feeds by, and about, those in the entertainment industry. Many entrepreneurs found direct relationships between those that had taken the entrepreneurship road and those that had chosen that of the entertainment industry. Similarities included the time it took to “take off”, the fact they were building one’s own audience, the sacrifices they had to make early in their careers such as taking low-paid jobs, and the fact that they didn’t always have full backing from family and friends due to them taking a less mainstream route. For that reason, many respondents who had created virtual social networks, included the books, audiobooks, podcasts and social feeds of entertainers including; Marc Maron, Joe Rogan, Joey Diaz, Dom Irrera, and Doug Stanhope to name a few, to learn from both the presenters and their respective guests. Whilst we were not surprised by the responses that stated that starting up a business can be a tough and sometimes lonely road, we were heartened to learn of the awareness of how potentially damaging this could be, and the fact that respondents had found ways to create company while creating their companies, to mitigate harm to themselves and their businesses, both physically and virtually. Mike Gardener is the founder and CEO of The Office Providers - a flexible office and workspace search service that assists entrepreneurs, startups and larger companies in finding the perfect workspace, for free. Searching for and acquiring serviced offices, managed office space, co-working spaces and leasehold offices in all locations globally.